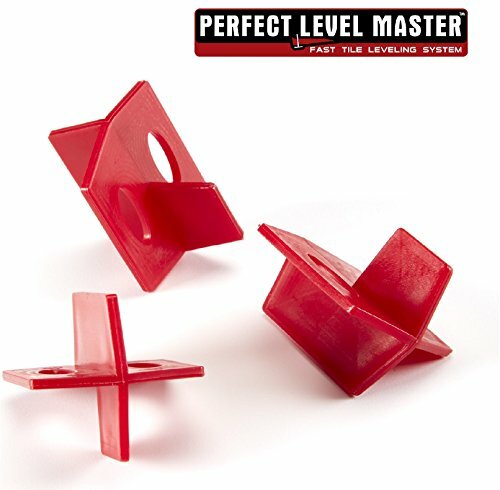 Perfect Level Master™ 3 side Tile spacers that helps achieve perfectly straight grout lines for various types of tile installation ! As standard "cross" spacer for straight pattern tile installation . As "T" shape spacer for brick and herringbone tile patterns !! As linear spacer to be combined in any application and patter..
Because of its shape spacer is Very easy to install and remove ! ! ! Spacers can be used hundreds of times and are very easy to clean!! Spacers do not fall in between grout lines. Also 1/32" and 1/8" spacers are avaliable - Please check my other listings . Spacers are made of hard plastic. Most spacers-wedges available on market are made of rubber, and when more weight is applied (especially when tiling walls) they will simply get squashed and our grout joint is automatically changing - disfiguring and ruining entire precise and time consuming installation !!!! Those spacer can be easly combined with T-Lock™ Tile Leveling System. They allow the creation of neater, more consistent grout lines throughout the whole installation.. Perfect Level Master™ spacers were developed to bring a perfect installation for all surfaces covered with tiles! 1/16" uniquely designed spacers can be used in 3 different ways. Can be easly combined with T-LockTM Tile Leveling System. They allow the creation of neater, more consistent grout lines. If you have any questions about this product by Perfect Level Master ™, contact us by completing and submitting the form below. If you are looking for a specif part number, please include it with your message.